Colossal Statue of King Tutankhamun from Dynasty 18, ca. 1334 BC, excavated by the Oriental Institute at Medinet Habu in 1930. OIM E14088 (D. 019245). View of the center exhibit in the gallery. The Mummy and Coffin of Meresamun from the Third Intermediate Period, Dynasty 22, ca. 946–715 BC. OIM E10797 (D. 019400, D. 019410, D. 019404). View of the southwest section of the gallery. Limestone ostracon painted with a scene of a boy being judged by a mouse and cat from Deir el-Medina, Dynasty 19–20, ca. 1293–1070 BC (OIM E13951). View of the southern side of the gallery. The Joseph and Mary Grimshaw Egyptian Gallery contains nearly 800 objects dating from the Predynastic Period through the Byzantine period (5000 BC–AD 600). A 17-foot tall statue of king Tutankhamun gallery stands at the entrance of the gallery. 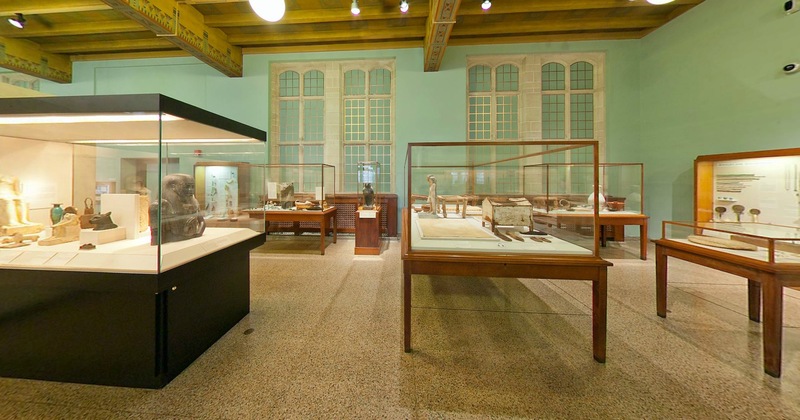 After a chronological introduction, the gallery is arranged thematically around the topics of writing; kingship; funerary beliefs (tombs, mummification, protection of the dead, mummies), and daily life (art, clothing, tools, jewelry, food, music, and games). Highlights of the gallery include the brightly painted coffin of a temple singer named Meresamun, a written account of the first labor strike in history (ca. 1182–1151 BC), an annuity contract between a man and his wife written in flowing demotic script in about 365 BC, and a group of statues from a tomb that show people engaged in everyday tasks dating to 2477 BC. Available for download from the Oriental Institute Publication Program.